We know custom window treatments and we understand how to accomplish the best possible look you want in your home or office. Over the years we have learned that it is the window that tells us what your options are - and coupled with our expertise - we guarantee you will be completely satisfied with your finished windows whether you have blinds, shades or shutters. We understand that window shutters and blinds not only enhance your decor they also protect your furnishings and flooring from the suns' damage. We provide window treatments that keep light out and light filtering window treatments - both effective for protecting your valuables. 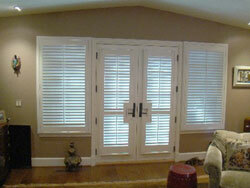 We carry all brands including Hunter Douglas (the largest blind company in the world), Levolor and Bali. We can customize any size, shape or color that you need. You will work with one of our Interior Designers to come up with the best window coverings to meet your needs. If you have a unique window we can help you. We do Box custom window treatments, Transom Windows, Arch Top window treatments, Patio Doors, French Doors & Slider Doors plus we provide ideas for very interesting window treatments. Whether you need an entire house or office building, or you need bedroom, kitchen or baby nursery or window coverings for a Bay Window, formal & upscale window treatments, we can get the job done for you. We also carry the only one of it's kind - the motorized shutter! The motorized shutter comes with a programmed remote and is great for windows high up or skylight windows. We have been in business for 22 years providing installation, repairs, measuring and consulting.